There is something magic about plaid that transforms any room into an inviting and distinguished space (picture yourself relaxing in a warm library in a Scottish castle, you spot some plaid, right?). Plaid is largely used in the autumnal season with blankets and pillows to add warmth and coziness, however when used as flooring in the form of rugs or tiling, it is an all season decorating element. 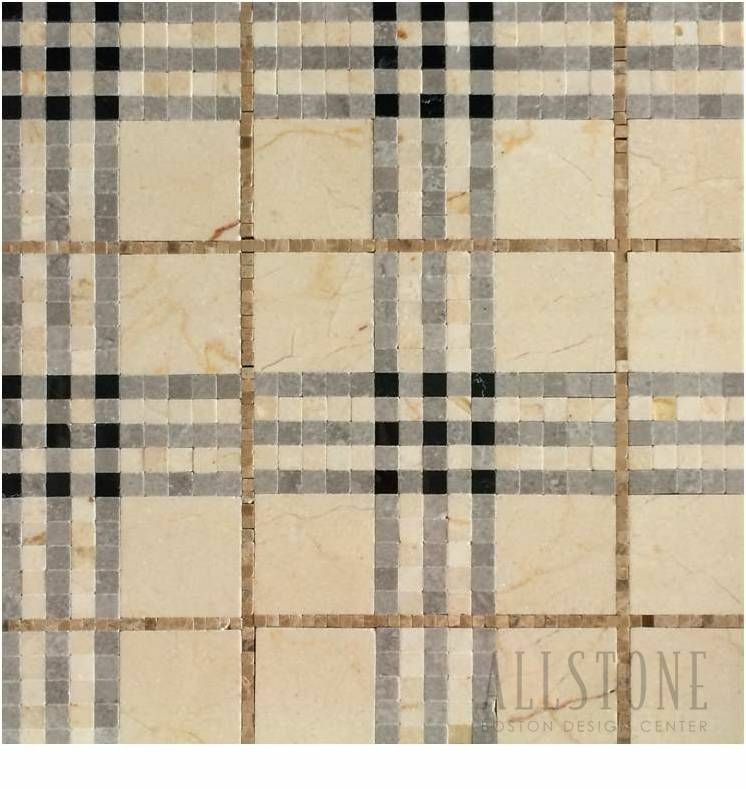 A more committing way to adorn your floors with plaid is tiling them. I could not find heaps of examples on the Internet, but I swear that this is a thing, and a great one! If you are after a flooring with visual interest while keeping your design neutral and classic, consider plaid! Embrace tartan trend without overkilling it! We have seen a lot of shiplap lately, so much even that we can call it a trend. But, why has that particular wall-finish become such a popular choice for designers and home owners? You will soon, see in the examples below, that shiplap brings elegance in a very subdued way. It also gives texture and character to a room, yet keeps the room calm and neutral. And best of things, it can be use in every. single. room! Shiplap is also most certainly an efficient way to fix damaged walls and give character to a room on a friendly budget, which are more reasons for its success. How to elevate your bathroom without breaking the bank? Curtains coordinated to the walls, a yes or no? Folding screens have always been around, but tend to be overseen. You may picture them as an old-fashioned accessory, catching dust in the folds of a faded fabric. Luckily, the modern version of folding screens is pretty and versatile. In the picture above, the screen dresses up a big white wall. This is particularly useful when you live in a rental, and you are not allowed to paint, install wallpaper or decorate your walls with some kind of art. For the ones who have to deal with a non-existent entryway, you can easily create one with folding screens. It doesn't require any effort and will change the look of your space. Folding screens are perfect as an alternative to a bedhead as shown above. Creating a gallery-wall on folding screens is a brilliant idea! It conceals a rather boring and dark corner in a very interesting way! The example above looks like a successful DIY. The screens divide the space and conceal the home office. It could hide your exercise gear as well. Concealing insight into a room or hiding an ugly view of the outdoor is something many have to deal with. Folding screens a very elegant way to do so. Out of ideas for decorating a wall? Add layer, texture and pattern (all in one!) with a modern screen as above! Which of the examples above are you most likely to use? Are folding screens something you have ever consider? This post was supposed to be posted much earlier. Unfortunately, Pinterest didn't work for several days and I was totally lost without my favourite source of pictures! Have you experienced the same problem? Anyway, I wanted to show you some particular examples of uses for mirrors. They may be particular because of their situation, number, shape or size. Besides their obvious functionality, mirrors are an accessory which have helped many interior designers trick the eye and change the feel of a room. Mirrors can be used in many ways, some are unexpected like the one in the example under. The huge mirror will create the illusion of a bigger, prettier, more lush and deeper backyard! Hanging up mirrors in the entry is no brainer, however thinking outside of the box and creating a gallery with multiple mirrors will make a statement! Another great spot to use mirrors is the backsplash/ splashback! The talented Susan Glick used an antique mirror behind the sink, which is an excellent move as it is a difficult place to keep spotless (hello, watersplashes!). I am stunned by the creative idea of repurposing the front of an antique wardrobe with mirrors as a door! That is really cool, right? Thinking outside the box makes a quite usual accessory like a mirror, into something very versatile. In any case, mirrors are your best friend in home decor, there are plenty of them out there, in any shape and for any price. Get creative and make your own mirrored furniture, it will save you some money. Dress up a wall or a closet and you can change the look of it without lifting a painting brush, the sky is the limit! Last week, I presented you the family-room of a lovely young family of 4. Today, I am thrilled to show you one of the kids' bedroom and what I call a retreat room. The family is commuting between two different countries so they hadn't had the time to decorate their toddler's room. She is now a bit older, and it seemed like the right time to make the room more personal and happy. We decided to decorate the bedroom in a gender neutral palette, as it may be shared with a sibling later. We added layers and colours in the space to warm it up. I love how the dressed windows make the room more comfortable, happier and elegant at the same time. The toys are collected and easy to reach in a trunk. I love when the books are a part of the decoration themselves. The bookshelves are simple, yet beautiful. I want to believe that they are more inviting, and that the child will be appealed to grab a book when it is being displayed that way. I made the pelmets to dress up the windows and add a bit of whimsical. They make a huge difference in the room! At the top of the stairs, there is an open room which was too exposed to the neighbours' sight and therefore not so pleasant to be in. The family's and friends' pictures are now collected on the wall, the curtains and the rug are smoothing the light and the acoustic of the room. The piece of art was already in the family, I immediately fell in love with it and its vibrant colours, and it became the obvious starting point for the room-design. I painted the frame to enhance the colours and give more depth to the composition. ​(Update: the painting is from Yolanda Dominguez). The retreat, which is conveniently situated next to the guestroom, is now a comfortable and quiet place to read a book, or just relax with music. I am very happy with the outcome of this project; creating enjoyable and livable spaces for a young family! Side-tables can fully act as a nightstand, for example like to the one above with shelves for storage. They are easy to tuck between the bed and the wall. However, their small surface will not always allow for a table-lamp. In that case, wall-mounted lamps or two ceiling-lamps are the solution! You can still have a functional bedroom even if it is really small. Floating shelves have zero footprint and are fun! The hanging nightstand below is one of my favourites. It is easy to DIY, organic and so stylish. I am sure that I will knock off my glass of water every night though! A budget friendly and flexible solution for small apartments: a chair, it will provide a surface big enough for your night-kit! Okay, the dresser is my favourite kind of nightstand: it is elegant and gives plenty of storage. Win, win. Bed in front of the window? It can work! I am constantly thinking about layouts of rooms. I like to try different ways to display furniture, it's an obsession. However I have NEVER placed a bed in front of a window! How strange is that? I have seen tons of beautiful bedrooms on Pinterest with this placement and I love how they look balanced and how the bed becomes the focal point of the room. I have a couple of projects in progress and I will definitely try to go out of my comfort zone and make an attempt. I would recommend making the window at least as big as or bigger than the bed by altering the window's width using curtains. So, what do you think? Would you place a bed in front of a window or have you done it already? Last summer, we decided to freshen up my son's bedroom. If you missed the post where I talked about it, you can catch up with this post of July. My son was willing to help with the project, which I was very happy for. Furthermore, his contribution granted him "points" for his high-school degree. A win-win situation! He helped me during the process and he photographed the finished space. Unfortunately, we waited a bit too long and the light wasn't good at all the day of the shooting. However, we are happy with this first attempt of movie making and with the mother-son collaboration! With some directions from my son, I created a mood-board. After his approval, I begun to source the few new items we wanted to incorporate in the bedroom. We both painted the room but he painted the accent wall by himself. It truly was a challenge requiring a lot of patience! Even if we painted the white walls in a greige hue, the bedroom feels lighter and definitely warmer. We had textiles and patterns for more interest and we worked with a blue - greige - black palette. With a few changes, we made this space much warmer and grown-up. I was totally thrilled when one of my friends asked me to refresh her daughters' bedrooms. The two teenagers are really lovely and fun to work with. They have both a pretty good idea of what they want, a great taste and get really excited every time I come up with a good proposition. The idea is to keep as much of the existing furniture as possible, and rather work on details, colour palettes and tie everything together. I asked them to send me some "inspiration-pictures" of rooms they were drawn to, and I begun to create moodboards. That's where we are now, and I will show you "after pictures" when it's all done! Here is the moodboard, minor changes are already planed and I think that we may include small shelves as they appear a lot in the "inspiration-pictures" that she sent. I am back from holidays, and while I had time to relax and enjoy sunny beautiful days, inspiration and ideas about things to do came in waves. Well, that's good, but now I have to sort out the chaos in my brain. I wish I could do everything asap and I struggle a bit with organizing my priority list. However since we already have talked about renovating our son's bedroom, I put it as number one on my list. My son's room is not bad, but blah. It really needs a fresh coat of paint and a bit of personality. I am coming with ideas and suggestions, but am waiting for his approval. I took inspiration for the walls from an advertising, I am not sure yet how to accomplish it, maybe a stencil or just freehand painting? I will take a week off in ten days, so I definitely feel some pressure to achieve as much as possible in this bedroom before that and before we get family visitors later in August and September. What do you think about the plans for now?